BBC Pump Adds ElectroCell HVAC Filtration Systems - BBC Pump and Equipment Company, Inc.
BBC Pump and Equipment is proud to announce an agreement to bring ElectroCell Systems to the Indiana market. 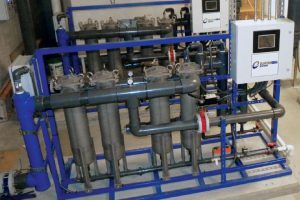 ElectroCell Systems manufactures side stream precipitation packages that remove total suspended and total dissolved solids from hydronic HVAC systems to decrease water, energy and chemical usage through improved thermal transfer. ElectroCell Systems prides itself on providing customers with the most reliable partner in our people, systems, and in all ongoing technical support. Their mission is to enhance the Chiller / Boiler operation by reducing energy and water usage for our customers. The exclusive ElectroCell system has been perfected by nearly two decades of R&D and is validated by extensive field installations. These packages will increase the efficiency of industrial and commercial systems.